”We did not imagine that our outdoor space could look that wonderful, be that restorative, that beautiful and be what it is and what it means to us. We are delighted with the results. Judi has been passionate and collaborative throughout the design, development and implementation process and has invested time in understanding, exploring and exquisitely delivering a beautiful and breathtaking garden. Judi has a warm and open communication style and her design and creative ideas are engaging, extraordinary and inspirational. Judi invests an incredible amount of energy and commitment into her work, and continually strives to create spaces that are meaningful and captivating. Her attention to design detail, flow and form are exceptional. Judi has created a unique and special sanctuary and a place that we will enjoy, share and explore for years to come. It has been a joy to spend time with Judi and learn from her creativity and horticultural brilliance, knowledge and expertise. Judi has transformed our home and garden and created an outdoor space and experience that we love and will cherish, always. “Judi came for a consultation initially and listened to what I wanted. She very quickly understood me, then spent some time studying our courtyard and made suggestions that were spot on. We spent time sharing ideas on Pinterest and then she drew up a list of plants with pictures from which I chose my favourites. If you are looking for a garden designer who listens to what you want, is very knowledgeable, professional, friendly and down to earth, then look no further – Judi is the one for you..
Having recently moved house, I decided that my garden needed a makeover. I trawled through Google searches on the internet, asked a number of local garden designers for advice and a quote and am so glad that I chose Judi. As soon as I met her, we struck up a good rapport and I knew that I could work with her and trust her with my garden. Judi is passionate about what she does, and is brimming over with ideas but she took great care to listen to what I wanted and incorporate this into her design. She consulted with me frequently throughout the design, commissioning and planting stages to ensure that I was happy with how it was developing. I had prepared a list of my favourite plants and everyone is, or will be, in my new garden. I live quite a distance from Judi but she was happy to project manage and went to great lengths to source local companies and materials for my project and sort out any issues which arose. We chose the worst time of year to start the work – the end of January, but Judi and her team worked uncomplainingly through some appalling weather, including Storm Imogen. Not only this, but she made me feel that my garden project and what I wanted were the most important things in the world for her. Judi has extraordinary vision and has transformed my garden. She will be returning in spring to plant the perennials which are not available in winter and I can’t wait to see how my garden develops. Judi was very thorough when visiting my garden to also discuss with me my favourite plants and colours and to also explore what I am looking for in my garden. She was brilliant at using her professional knowledge to give me ideas I would not have considered myself, while always incorporating these within my wishes for my garden. Her team worked very hard, and with great care, as they carried out our plans. Since the redesign of the garden she has been conscientious in maintaining contact through ongoing advice and encouragement. Judi has been very friendly and supportive throughout the process of garden design. She is truly a nurturing person, in her work and in her relations with others. My garden needed some TLC after the winter so I decided to seek help with planting and re-design. I found Judi on Freeindex and was impressed by her enthusiasm and energy. Judi drew out a new plan for our garden then selected and sourced the plants to help fill in the beds. Planting and landscaping was done over 6 days in all weathers. She and her team worked very hard to complete the project. I am now enjoying my lovely garden. Are you looking for an inspiring gardener to make your vision for your garden a reality? We wanted a garden that lends itself to family life suitable for multiple uses. 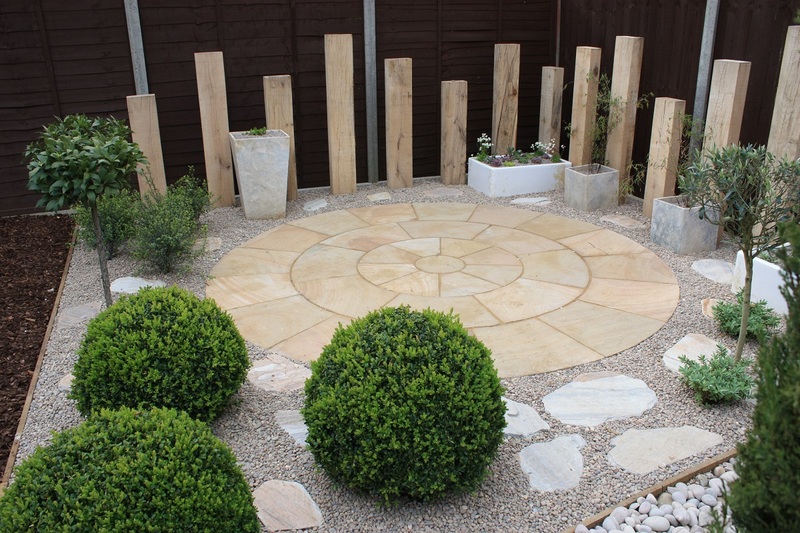 From the outset, Judi listened to our ideas and incorporated our wishes into a bespoke small garden design in a way that we would not have been able to do! The Plan was a 2D colour drawing of what our garden would look like including the names and colours of thirty plus different plants – exciting! Once work began, we hit a snag – a number of large unwanted concrete slabs (including an air raid shelter) were discovered around our garden. However, we were impressed by how Judi effortlessly and professionally resolved this matter along with equally charming colleague Tony and a useful power drill! Roll forward to the present and we have an attractive, larger looking new garden, in which we are able to sit, play, eat from, swing, barbecue and just relax…all at the same time! Thank you Judi for being ingenious, flexible, always mindful of our budget and a pleasure to work with! I was looking for a re-think of my small garden and I was recommended Judi by a friend. When I first meet Judi I took to her straight away, she was very friendly and understood exactly what I needed for my small garden (I particularly wanted low maintenance plants). Judi selected all the plants for me and I was very impressed with her plants knowledge . She has improved my garden so much and I am now looking forward to seeing them grow. I am more than happy to recommend her. Judi really delivers the goods. She consulted us every step of the way and kept us informed throughout. She is thorough and professional. Our garden is transformed and is beautiful from every angle. She started by consulting us for what our vision was and then delivering it. Nothing is too much trouble. Judi is delightful. From the moment we met Judi she appeared friendly and super passionate about her work. She understood immediately our brief and got back to us within a week with the most fantastic garden plan. It contained details of every single plant with pictures to help you visualise the end result. Judi offers a range of other gardening services and we are looking at commissioning more of her time. She is aware of her clients limited budget (as is our case) and will give you tips to buy plants cheaper. We heard about Judi from a flyer we picked up at a local garden nursery and decided to take a ‘chance’. We are so glad we did and would confidently recommend her to anyone. I can’t recommend Judi the Gardener highly enough. She is enthusiastic, easygoing, professional and highly knowledgeable about plants and garden design. She has completely transformed a corner of our small garden in east London, working to a tight budget. She created a bespoke Dingly Dell, a leafy retreat with plants surrounding a garden bench, taking into account what we’d asked for with regards to colour, plant types, design etc. I can now enjoy my garden in a way I couldn’t before, and the space is put to much better use. It was well worth every penny. My garden was in dire need of help. I found Judi via Google and was struck straight away by all the glowing reviews. They are all true! As soon as I met her I knew she would be the right person to transform my garden. Judi understands my needs to a tee. On meeting her the first time I also felt comfortable enough to give her my key as I don’t have side access. Judi is passionate about gardening and it shows in her enthusiasm. She is trying her very best to get me enthused too and I am starting to get there! I am looking forward to seeing the garden develop over the coming months and sitting out in it once again. We found Judi through a web search since we were looking for a Garden Designer whose main interest was in plants rather than patios. She came over for an initial (free, I think) discussion and survey and it was clear that she had both very good knowledge and great enthusiasm. We had a new fence so a full bed needed replacing in our front garden and we removed two high long established privet hedges and a low wall. Over the next few weeks Judi was generous in e-mailing answers to questions and our changing ideas. We then went forward with 5 days work for her, a colleague and for three days another man also. The team were friendly, extremely hard working and it was a pleasure having them around. The plants arrived in excellent condition and have thrived during the past three months. Judi’s skill has given us a colourful range of shrubs and climbers and we are delighted with the result and have no hesitation in recommending her. Judi’s enthusiasm and knowledge about gardening really is obvious. She carried out a free site survey and prepared a planting plan that took into account what our garden was like: light, shade, soil type, what we liked and what we wanted to use the garden for. Judi’s other strength is that she listens and takes her clients’ opinions into consideration, a very important quality in a trades person. She prepared our borders and suggested where we should go for materials. Judi then came with us to the garden nursery and helped us to select our plants. On top of this we got a great discount through her and she planted our plants and gave us loads of advice. After only three visits our garden is now looking like somewhere we’d like to sit in and enjoy rather than the uninviting, boring space it was before. They say that you do business with people you like and we certainly like Judi.